Kelly Ripa is such a bag full of cheer every morning (crazy early in the morning, too, remember) that you can’t imagine anyone being immune to her positive attitude and charm. But the Live with Kelly and Michael host recently revealed that one person is so NOT her #1 fan -- her 13-year-old daughter Lola. Kelly admitted that she doesn’t think her teenage daughter likes her -- and you’ll love what she has to say about that fun fact. While some of us -- model Yasmin Le Bon, who famously admitted her teen girls were so mean they made her cry, comes to mind – can’t stand those few but long years when teen girls seem to turn against their moms overnight, Kelly is realistic about the whole thing and her attitude is totally refreshing. The 44-year-old told Wendy Williams she doesn’t care if her daughter likes her or not and said she told her, “I’m not your friend, I’m your mom.” She added that she feels it’s her “obligation” to keep Lola living in the real world and that it makes no difference if you’re a famous and wealthy celeb or a mom working three jobs – when you’re a mom, that’s your number one priority. Three cheers for a mom who is more interested in passing along good values and disciplining her child than in gossiping about boys and sharing cigarettes with her. Ripa shared how her teen “broke the rules” recently by failing Spanish class and how utterly unacceptable that was to her and husband Mark Consuelos because she is half-Mexican and has a Spanish-speaking grandmother. Her awesome punishment was to take Lola’s phone and take away any Internet privileges she had because she realized her daughter was on Instagram when she should have been studying. I love thinking that Kelly -- with her insane schedule which likely includes waking up at 3 a.m. to get ready for her show and then living a full day as a hard-working mom -- doesn’t neglect her parental duties. And she isn’t afraid to dole out consequences where they are needed, regardless of how unpopular they'll make her with her teen daughter. 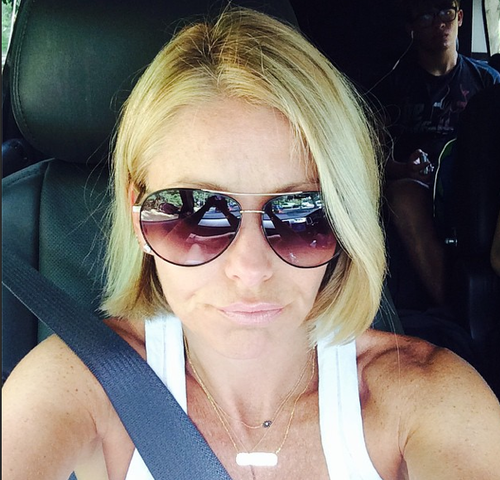 What do you think about Kelly’s attitude toward her teen daughter? Are you a mom or a friend – or both – to your teen?